October 2012 saw the 50th anniversary of the introduction of rear engined buses by Nottingham City Transport. The subject of the image is a Daimler Fleetline CRG6LX, fleet number 62, registration number 62 NAU. It had a Park Royal H77F body. It was delivered new to NCT on 12.12.62 and entered service on 18.12.62. It is seen here at the Farnborough Road/Pastures Avenue, Clifton Estate, terminus of service 68 when new and is loading passengers for a journey to Broad Marsh Bus Station in Nottingham via Clifton Bridge (service 68 journeys operated by South Notts and West Bridgford UDC ran via Trent Bridge). The large Daimler badges with which 62 and others of the batch (nos 46 to 63) were fitted when delivered were quickly removed and replaced by a Daimler scroll, as there was an air intake at this location and the large badge partially obscured this. This year also saw, on 29th October, the 60th anniversary of the introduction of the joint service operated by NCT, South Notts and WBUDC to Clifton Estate, although the 68 was not introduced until 1956 when the initial development of the estate was nearing completion. With reference to the posting above of 62 NAU when new, here is a view of one of her sisters, 50 NAU, towards the end of her working life. She is seen peering out of the doorway of the Burwell & District depot in Burwell on 25 August 1978. Nottingham’s livery always was one of the smarter ones and the view of 62 does it credit. This is a good example of a well applied livery helping to ease the rather brutal lines of the ‘Orion’ derived body design. The tasteful layout of the fleet name and the red wheels set off the green very well. I remember one of this batch coming to Rochdale to be shown to the Transport Committee in the Autumn of 1962. 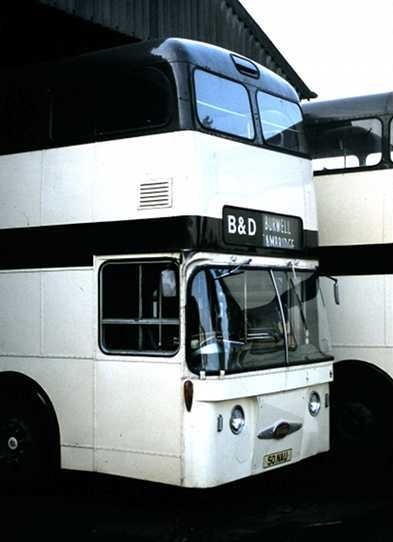 It was probably brand new and was parked outside the Town Hall along with the light blue AEC Renown demonstrator and the Leyland Atlantean demonstrator in Maidstone & District style green and cream. It was just after the 1962 Commercial Motor Show at which the Renown made its debut. Rochdale chose the Fleetline for its next double deck purchases. Interestingly in Pete’s picture 50 NAU has a much more modern windscreen and front panel than 62 yet has retained, or had re-applied, the large Daimler badge. 50 NAU was fitted with the 1964 pattern windscreen and dash arrangement following accident damage circa 1968/69. From memory it ran off the road on Carlton Hill and hit a house. At the time of the accident it was allocated to Bilborough Depot and was working a ‘works special’. Peter mentioned he was sure someone would comment upon the newer front end on the Burwell vehicle. It looks to me like a ‘Manchester’ lower panel, as Birmingham had on some of theirs towards the end of 1966, but I had no idea why it should have been treated. Thank you, Michael, for enlightening us. Ronnie, interesting comment about the freedom of operation in the NGT group. I suppose it is hardly surprising that the same degree of freedom seems to have filtered throughout what is now the ‘Go Ahead’ group. There has been discussion on this site in the past about the NBC and BL ‘master plan’, and we all know what happened to both! Philip, slightly off topic but was it my imagination that the lower deck window line on all of Rochdale’s Fleetlines was higher than normal or were the wheels smaller? Back to Nottingham, I often wonder if the department’s development of their own unique body style which, like the various developments or not were at least different and interesting to look at, was a reaction to the bland Orionism of early rear engined bodies or just a determination to be different. The Daimler badge fitted to 50 NAU was not the original `large` one, but the shorter version, common on most Fleetlines. I found the appropriate part no. in the Fleetline parts list and ordered 4 from the local BL parts dealer, they duly arrived, price around £18 + VAT and were fitted to 50/53/61/3 NAU. By the time 56 NAU arrived at Burwell, (via Ensign) I had secured a supply of the original `longer` badges that had been supplied to Walsall Corporation, but were too long to fit on the rounded front panels of their `short` Fleetlines. To answer Phil on the Rochdale Fleetlines, yes you are right they did have the lower saloon window line about a foot higher than normal. The reason was that despite the Fleetline having a drop-centre rear axle, Rochdale adopted a two step entrance with a high floor line throughout the lower saloon. In my view this had two negative affects. Firstly, it made the buses look very ungainly from a three-quarter front view and secondly, as the lower driving position was retained it put the driver in a very intimidating low position against boarding passengers. This must have been an especially uncomfortable position for drivers when later on these buses were used for opo with fare paying passengers towering above them. To me these were some of the ugliest buses ever built and massive contrast to the previous Regent V’s. Thanks Philip. I always thought they were odd. I used to see them regularly in the 1960s and 1970s but was normally driving past them, so couldn’t study them closely, and I never rode on one. They certainly were ungainly looking – not helped by the acres of cream paint, the SELNEC livery, for once did help a bit. 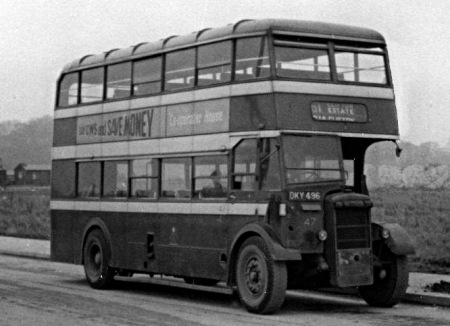 After Nottingham City Transport had obtained the ex Bradford lowbridge Daimlers to start the services to the then newly developing Clifton Estate, an existing order for Park Royal bodied AEC Regent IIIs was amended, and 10 were delivered in April and June 1954 with lowbridge bodies as 199-208 (SAU 199-208). These lowbridge vehicles were needed as the railway bridge on Wilford Lane (ex GC main line) precluded highbridge deckers being used. However, in March 1958, another bridge over the River Trent was opened, and NCT services serving Clifton Estate were diverted over this new bridge, known as Clifton Bridge. This meant NCT no longer needed lowbridge vehicles, but West Bridgford and South Notts continued to use Wilford Lane. By 1964/5, I think the lowbridge Regents tended to be used on works extras, and service 2, between Goldsmith Street and Valley Road. The first of the batch were withdrawn in early 1967, when 199-202 were taken out of service and sold. 199 stayed locally, becoming Barton 1087 until 1972, when it was withdrawn and exported to America. However, in September 1968, NCT took over the West Bridgford fleet and inherited their Clifton services with its lowbridge requirement. At this point, the remaining SAU Regents, 203-8, came into their own again, reappearing on the Wilford Lane services to Clifton, quickly replacing the non standard pair of ex WBUDC Willowbrook bodied Regent IIIs, ORR 139/40, which were 6812A chassis, with the 7.7 engine and crash gearbox, rather than the 9.6 engine and synchromesh gearbox of the SAUs. 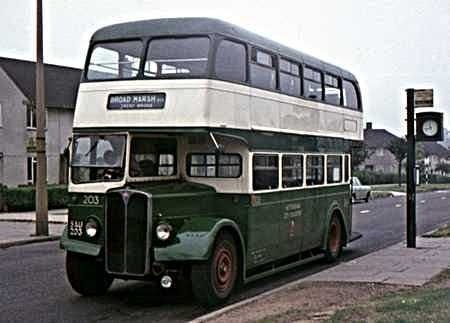 These buses were delivered in the traditional NCT livery of green with three cream bands, but all were repainted in the brighter livery adopted in the early 1960s. 203 was photographed in August 1969, at the Clifton terminus of service 67. 203-8 were withdrawn in 1970/1, along with the ex WBUDC Reading bodied Regent Vs, and were replaced by Atlanteans 395-400 (VAU 395-400J), which were a special lowheight version of the then standard Nottingham design on PDR1/3 chassis. As a postscript, history repeated itself a few years later when the Atlanteans were themselves rendered surplus to requirements as lowheight vehicles early in their life, with the removal of the low railway bridge on Wilford Lane in autumn 1974. They remained in the fleet until withdrawn in 1981, when five of the six were exported to Hong Kong, via Paul Sykes, but that’s another story! OK, I’ll be the smart alec that reckons this must have been a Saturday morning (assuming the timetable was still the same as two years later). The clock shows 11.43. On Mondays – Fridays, the 67 only ran via Trent Bridge hourly, and its departure time from Langstrath Road was 41 past. Sundays it was hourly at 56 past. But on Saturdays it was every 24 minutes, and on the odd hours this was 00, 24 and 48 past. The journey to Broad Marsh took 22 minutes – it was only 19 via Clifton Bridge. For many years the numbers were the same by either route. Stephen – Spot on! August 2nd, to be precise. Timetabling to serve three different termini, each by two different routes, with different end to end journey times, and joint working with South Notts on the Trent Bridge services, was quite complex – especially when you remember that the actual buses were not interchangeable between the Clifton Bridge and Trent Bridge variants! The main routes were 61A, 67 and 68, each running either via Clifton Bridge or Trent Bridge. The 61 and 66 were by this time rush hour short workings. Monday-Friday daytime had a combined 10 minute interval service via Clifton Bridge (half-hourly to each terminus). There was a 20 minute interval service via Trent Bridge (hourly to each terminus). Overall, buses left Broad Marsh in a repeating sequence of 10,5,5,10,5,5 minutes. On Saturdays, all six services (three by each bridge) ran on a 24 minute headway. You might expect this to level out to an overall 4 minute interval service (every 8 minutes via each bridge). Such was not the case, however, no doubt for good logistical reasons. Instead the Saturday departures from Broad March were in the repeating sequence of 6,4,2,6,4,2 minutes, and the interval over each of the bridges was 6,10,8,6,10,8 etc. I wonder who worked that lot out! I note the photo was taken in 1969. So I’m sure one of the experts can answer the question "When did Nottingham City Transport finally stop using open rear platform buses?". My memory (unreliable) tells me that there weren’t any beyond the early 1970s. They seemed to disappear relatively early compared to other operators. Of course it’s obvious now but something which hadn’t really occurred to me before is that South Notts had a strong presence at both Huntingdon Street and Broad Marsh. Was there ever anyone on hand to supervise the departures or were they left to their own devices? I’m not suggesting for a moment that they (or the others) would have been anything less than professional but as Stephen says, it was a complex operation. I wonder if South Notts rosters contained any inter-working with the Loughborough service or if Clifton services were kept totally separate? They had exposed radiator AEC Regent Vs running in 1971 The last open platform deckers bought dated from 1959 so withdrawal in the seventies would be reasonable. KC NCT’s last open platform buses were withdrawn in 1976. (11 Regent Vs from 1956, and 6 PD2s from 1959). The final ex WB Regent Vs had been withdrawn in 1974. The last half cabs in the fleet, the 1965 Renowns, were withdrawn in 1976/7. Unlike many, I quite like the enclosed Regent V front, but – like the PD2s and PD3s – I do prefer the exposed radiators. There is a dignity in style which is missing on so many "tin fronts". I think the reason for the emergence of the tin front was the revolution in the appearance of single deckers. Half-cab single deckers became obsolete almost overnight in 1951, making double deckers look dreadfully old-fashioned by comparison with the new underfloors. I must say that as a bus-mad child in the 1950s I was completely sold on the idea. I thought the tin-front Leylands of Oldham and Southport looked far better than Manchester’s archaic exposed radiators. It was only when the tin fronts themselves started to look dated that the traditional purity of the exposed radiator won out over the (by then) out dated attempt to disguise it. The enclosed Regent V front looked like a reshaped radiator rather than a disguised one. Car manufacturers had already started doing the same thing, retaining the distinctive features of their traditional radiators in their new grilles but in a lower, wider shape (the most obvious comparison is Rover), and by common consent AEC’s approach was more successful and stylistically durable than the others. Am I right in thinking that in my time at Nottingham (66-69) one make (AEC or Leyland) was in the majority on Derby Road north of the university campus, and the other make in the majority on University Boulevard south of the campus? or does my memory play tricks? Atlanteans were in evidence from City centre to Trent Bridge for the football, but I only recall open platform designs serving the University. I do remember once travelling in a lowbridge side gangway vehicle from University boulevard to Beeston. I also remember a late night city centre start with a full bus and flat battery, the bus was facing uphill so reverse was engaged and the engine started with no problem. Nigel, the 5 (Beeston via Derby Road) and 5A (via Castle Boulevard) were certainly operated by the same buses. They ran as a circular route – outward as a 5, inward as a 5A and vice versa. This avoided the need to reverse in the congested centre of Beeston before the bus station was built. However it may well be that the other north side services (19 and 63) used a separate group of vehicles from the other south side services (4 and 4A). Both the 4 and 5 displayed "Beeston via Derby Road" but they were completely different routes. The 4 turned off Derby Road at Gregory Street, Old Lenton, joining the 4A route along the southern perimeter of the campus (University Boulevard). The 4 and 4A avoided the reversal problem by continuing beyond Beeston Square along Chilwell Road, and round the block Collin Street, Gladstone Street to terminate at Imperial Road. I seem to remember that in 67/8, 4,4A, 5,5A were a 50/50 split between AEC Regent Vs and Leyland PD2s. Don’t know about 19 and 63 though. Hi Bob, yes, you are probably right. My point really was that there couldn’t have been an operational segregation between the "south side" and "north side" services, since the 5 and 5A at least were the same vehicles running out by one route and in by the other. I think by this time the Regent Vs and PD2s were the only back-loading half-cabs left (and no doubt many of these had also been withdrawn). I can’t remember whether the Renowns ever got onto these routes. Incidentally, in checking with the 1971 timetable, I discovered that the 63 was routinely scheduled a 15 minute layover at the outer terminus (Wollaton Vale) – 20 minutes journey and 15 minutes layover. Nice work if you can get it! Bob – I think the SAU Regents became an embarrassment to NCT after the diversion of their Clifton services via Clifton Bridge. Here was a batch of ten buses no more than four years old and with three years of the initial certificates of fitness still to run with no real work to do. As you say they found employment on works services. The only requirement for lowbridge buses was the once or twice a week service to the White City dog track on Trent Lane from Clinton Street. I recall seeing an SAU regularly on a service 4 going into Nottingham when on my way home from work during 1967. Stephen – in 1969 there was still a 30 minute service on Sundays via both bridges. Saturday evening SB 3 buses; WB 2 buses. NCT was the major operator with 55% of the mileage operated. South Notts had 25% and West Bridgford 20%. Chris – South Notts Clifton workings were kept separate from its ‘main line’ services. There were some early morning journeys from Gotham garage running out to take up service at Clifton advertised and passengers using these journeys had to pay the relevant fare from Clifton as well as a fare from Gotham to Clifton. On the question of supervision, although South Notts had two Inspectors I cannot remember seeing them at Broad Marsh during the period I was using Clifton services. I did however see NCT Inspectors at Broad Marsh – mainly during the teatime peak – observing departures of NCT buses. West Bridgford also had Inspectors but I don’t remember seeing them at Broad Marsh. Thanks for all the insight into early Clifton Estate runnings, I must admit it has always confused me how the percentages were worked out. Certainly a lot more interesting than todays services on the Estate! Some months ago, June 2011 to be precise, there was a question on the Q&As page from Stephen Ford about the ex Bradford lowbridge utilities acquired by Nottingham Corporation Transport for the then new Clifton Estate services. I have now come across the above photograph of 47 (DKY 496) at a somewhat embryonic Clifton Estate. I have been told that the shot is likely to be Green Lane, Clifton but I can not be certain. One odd coincidence is that the Daimler utilities were NCT numbered 44-50, the same fleet numbers reappeared on Clifton services a few years later, 44/5 on 1959 Metro Cammell PD2s and 46-50 on 1962/3 Park Royal Daimler Fleetlines. If you are interested you can view Stephens original question at this link. Re John Whitakers comment to Stephens original question Pigtroughs and the ‘Flat’ part (roof?) may be understandable, but why the ‘Harriet’ part? Nice photo of one of my favourite batch of Bradford buses! Many thanks. I honestly do not know where "Harriets" comes from Chris, but I think it was just a Bradford "rudery", one of many which former mill workers such as myself tried valiantly to disregard! Doncaster had some highbridge Weymann CWA6’s which looked a bit uncurved like this and lasted much longer – ’43 -‘ 58 – and seemed indestructible, if I recall, rather agricultural. 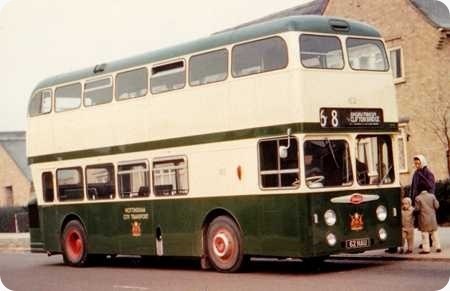 Bradford had highbridge CWA6s too, Joe, and these lasted until 1958, until replaced by 25 ex London RTs.The lowbridge ones were sold earlier, as there was no need for lowbridge buses in the city. Also sold by 1953 were 467, the solitary lowbridge Arab 1, 474/475, 2 Weymann highbridge Arabs, and 6 Massey bodied CWG5 Daimlers, 468 -473. 467 was retained as a "school bus" , BCPTs term for a driver trainer. As a schoolboy, I loved the flat Harriets so much because they were so different. I always had a fascination for old and decrepitly scruffy buses as they contrasted so vividly with the "posher" stock. I defer from going into further detail regarding the meaning of the phrase,except to say it was not graciously received if directed towards young ladies! I never used the term myself! Probably Green Lane, but could be either the junction with Southchurch Drive (in the centre of the estate) – route 61 terminus, or with Farnborough Road on the south eastern perimeter, which, I think, was the original terminus of the 61A (later extended to Glenloch Drive). Unfortunately, it is not quite possible to read the route number on the combined blind. "Clifton Estate" is just about legible, and my impression is that the number is too long for the simple 61, so could be 61A. Clifton was a council estate re-housing occupants from slum-clearance property in the city. Car ownership was low, and a decent bus service was indispensable from day 1. For a year or two the termini of the progressively extended services were building site locations – probably a big help to the construction workers too! OK – I retract that. From the closer view it is very clearly 61. 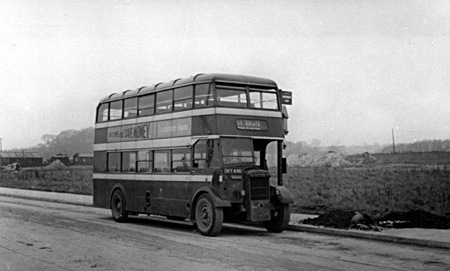 The picture was taken at the original Farnborough Road terminus. The vehicle having turned round at the Southchurch Drive junction. This stop was the site of the temporary wooden St Francis Church building. The Daimlers were delivered to Nottingham in BCT blue but were repainted before entering service. Bus 47 entered service with NCT in January 1953 (we moved to Clifton on 12th January 1953). I don’t think that this is at the original terminus at the north junction of Farnborough Road with Southchurch Drive as the Wimpey site huts situated at this location are not there (there was housing on the opposite side of the road)and the lie of the land looks wrong. Service 61 was extended along Southchurch Drive to its junction with Rivergreen from 28th June 1953 and further along Southchurch Drive to Ruddington Road (later renamed Green Lane) from 7th March 1954. Service 61A, which is partially visable on the close up of 47’s destination blind, commenced operation from 4th April 1954. Initially the 61A only ran Monday to Friday peaks and on Saturday. The location of 47 isn’t the 61A terminus at Farnborough Road/Ruddington Road as there was already some housing at this location when the service started and Rudington Road isn’t visable in the background. Likewise,I’d rule out Southchurch Drive/Ruddington Road as Ruddington Road isn’t visable in the background (construction of what became known as ‘the top shops’ – at least in where we lived in Clifton – didn’t start until 1954/55). I’dgo with the location being Southchurch Drive/Rivergreen. The land at the side of 47 was subsequently occupied by the Clifton Methodist Church and the rising ground in the background would also be consistant with this location. Service 61 started operation on Wednesday 29th October 1952 after a process via the East Midland Traffic Commissioner that started in September 1951. 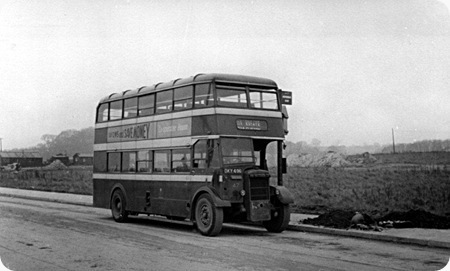 The process was often acrimonious and subject to unsuccessful appeals to the Minister of Transport by all parties when Road Service Licences were granted at a hearing on 24th September 1952 to NCT, WBUDC and South Notts. So this October will see the 60th anniversary of bus services to Clifton Estate starting. The location of your photograph is Southchurch Drive Green Lane Glapton Woods Whitegate Woods are in the background the woods are on a hill and yet with no houses yet built this would stand out. I remember crashes and break-downs coming home from school at Attenborough up the Derby Road Hill to the stop before Canning Circus 1954 ’til 1959. What number bus would that be? Then going to Mundella Grammar School for a year (1960), don’t remember the bus for that- anyone know? I think it was a No. 45 bus that took me to Margaret Glen Bott School at Woollaton for the next 4 years. After that, it was Clifton Hall Girl’s Grammar School- anyone know what bus that would be from Western Terrace just in the Park Estate (knocked down now!!! boo hoo) to Clifton !965-67? I am writing my memories down so I would be glad if you could pass me on to anyone who is interested in those areas at that time. Thank you very much, I include my e-mail address, just in case I might receive some helpful information. Like how long did the Park Estate use a horse and cart. I set up a petition to save the horse from redundancy. It was in the papers. 1. Attenborough to/from Canning Circus would be by Barton’s (red buses). There were a number of route numbers (and routes). The most usual route taken by the 3, 5, 5B, 10 or 11 was Attenborough Lane, Depot Corner, Beeston Square, Broadgate (or Queens Road), University Boulevard (or Beeston Lane through the University campus), Gregory Street, Church Street, Lenton Boulevard and Derby Road. The 5X went along the Chilwell by-pass and Queens Road, missing Beeston Square, but otherwise as above. The 5, 5B and 5X were usually double deckers, the others always single deckers. 2. Mundella was near Trent Bridge, and would almost certainly have been a 43 trolleybus from the stop at the top of Alfreton Road – they ran about every 3 minutes throughout the day. Down to the Old Market Square, then Wheeler Gate, Albert Street, Lister Gate (now pedestrianised), Carrington Street past the Midland station, and Arkwright Street (also now pedestrianised), terminating at the Embankment, although I think Muskham Street – the last stop before the terminus was slightly nearer to Mundella. 3. Margaret Glen Bott was on Sutton Passeys Crescent, Wollaton Park estate, and a 45 trolleybus from the Canning Circus stop on Derby Road sounds right, although a bit less frequent than the 39 trolleybus from the Canning Circus stop on Ilkeston Road. 4. Finally, Clifton Hall Girls Grammar. There were several services to Clifton estate (61, 61A, 66, 67 and 68) run jointly by Nottingham City Transport (green buses) – via the new Clifton Bridge opened in 1958, or West Bridgford UDC (brown buses) and South Notts (dark blue buses) – via Trent Bridge and Wilford village. These started from Broad Marsh bus station, but all of them turned into the housing estate at Farnborough Road, quite a long way before reaching Clifton Hall. You would get a good half mile closer by using a South Notts bus heading out to Gotham and Loughborough. This started at Huntingdon Street bus station and by passed the estate, continuing straight along Clifton Lane past the bottom of the drive to Clifton Hall. From Canning Circus, you would take a 43 trolleybus, changing either at Broad Marsh for the joint service, or Trent Bridge terminus for the Loughborough bus, or possibly a 39 to the Central Market, King Edward Street, for Huntingdon Street bus station. For more general memories, you might like to try the www.nottstalgia.com forum.